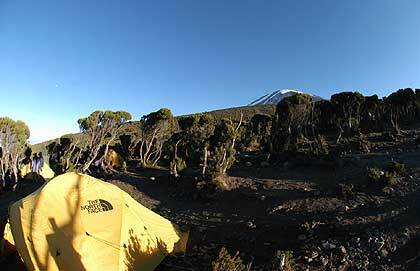 Hi, this is Kit reporting from Mweka Camp at 9,840 ft (3110 m). So this was the big day as we reached the summit of Uhuru Peak at 19,339 ft (5894 m) and have safely descended to this camp. It was a very tough day yesterday. It took 6 hours up pretty steep trails and some scrambling to reach the crater. And then this morning we were up early to make the final summit push. The camp last night was beside a huge glacier but unfortunately most of us were not feeling quite up to wandering around but we are all doing well. We are looking forward to the next part of our trip which is the safari.